These are the words that inspire the people of Orenda, who provide management consultancy and training for social care organisations. Their mission is to provide practical help to social care organisations when and where it’s needed to help them fulfil their own goals. The client wanted their website to be creative, flowing and artistic to represent the nature of their organisation while being structured and easy for viewers to find and access all of the website’s varied content. This client also asked for a Logo Design with this site and as you can see, it has become the main focus of the homepage. It is used in the name of the organisation as well as in the background. You can also see this logo on their Twitter and Facebook page, uniting all the various media used by Orenda. Having a professionally designed logo means you can use it anywhere within the workings of your company and it is instantly recognisable whether you are creating print work like fliers and posters or digital items such as email signatures and profile pictures. 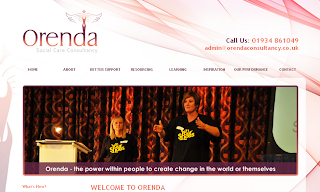 The Orenda logo specifically was made to be unique-looking to separate them from any competition and I think you’ll agree has a very etheral feel about it. Other distinguished features of this website that help it stand out from the crowd include the semi-transparent drop down menus which make the most of navigating the website’s 19 pages of information and the live Twitter feed which is constantly updating on the left.